Control every context menu in ABAP WebDynpro Applications to simplify your user interface and extend it with your own functionality. All extensions are context-based and can be defined via customizing. Call your own functionality in SAP standard applications with one click. The WebDynpro context menu available by right-clicking is already offering context-based functionality. However, usually it is showing functionality that you do not want to offer to your users. The sheer functionality often confuses the user. Meanwhile, the context menu does not show extended or enhanced functionality that you do want to show in it. SophisTex Context Menu Control solves all these issues and can be customized in a maximum flexible way. Control your SAP Floorplan Manager applications using information from the displayed object e.g. provide plant specific views in the Material BoM application. The SophisTex solution Floorplan Manager View Control allows context-based customizing of WebDynpro Floorplan based applications. Add, remove or rename views dynamically during runtime. Elemental for every SophisTex solution is a customizing that is easy to change while offering all the possible flexibility. SAP WebDynpro Floorplan applications offer a standardized layout that helps your users to feel at home in all different applications. 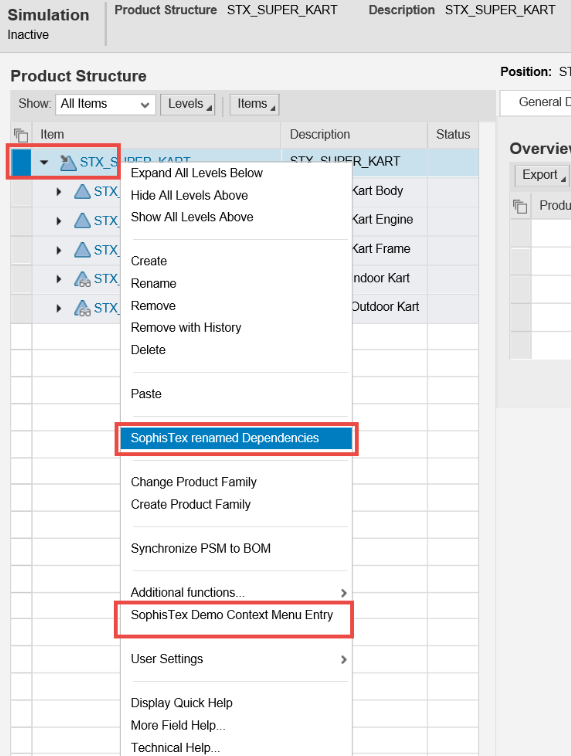 The SAP standard also allows a limited enhancement to these Floorplan configurations. However, enhancing the configurations is very limited and then applied for all users and user-groups. Normally, you want to offer different views in these role-based applications, which is not possible. Furthermore, standard views (tabstrips) are added during runtime and are not shown in the Floorplan configuration. Our Floorplan Manager View Control offers all flexibility by simple customizing. The SophisTex solution Floorplan Manager View Control allows context-based customizing of WebDynpro Floorplan based applications. Add, remove or rename views dynamically during runtime. Hide views (tab strips) that cannot be hidden by enhancing the standard Floorplan configurations because they are added during runtime. Use context such as attributes from the application object (e.g. BoM Usage or Plant in a Material BoM) or user rights, roles and ACM groups to offer a fully role-based application. Control your custom coding (enhancements, modifications, Z-coding) and relax in case of support requests (OSS tickets) that you send to SAP. Define your implementation projects and control functions based on context information as your user or environment parameters. The SophisTex Switch Framework enables you to structure custom coding and enhancements and easily switch them on and off by setting a single global switch. The SophisTex Switch Framework controls individual software projects (customer specific developments or enhancements to SAP standard functionality) with multi-level switches. Switchable functionality offers the possibility to easily deactivate all enhancements resulting in a complete standard SAP system within seconds to prove that issues in the SAP standard are not caused by Z enhancements.